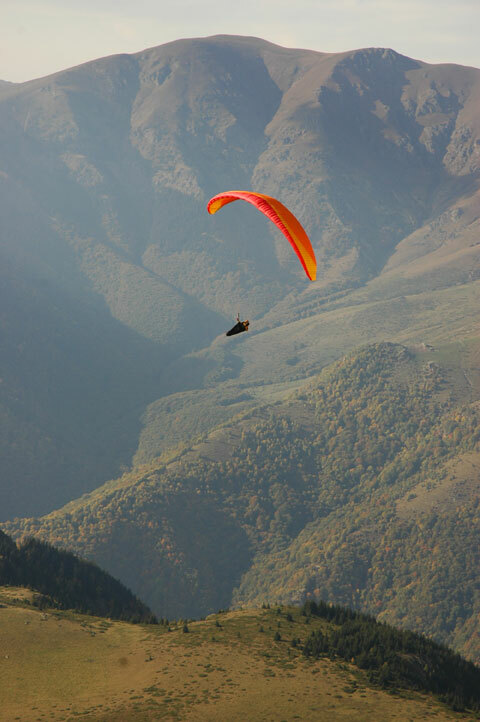 SkyNomad Paragliding School is based in Sopot – the best flying site in Bulgaria and probably in whole Eastern Europe. Sopot is in the middle of a 400 km long and 2300 m high mountain range called “Stara Planina”, which means “Old Mountain”. Unlike Alps like mountains, Stara Planina is quite hospitable with rounded grassy summits, used since ancient times for grazing sheep, cows and horses. It was also an ice age barrier when glaciers were covering most of central and north Europe. The warm south slopes and sunny flatlands provide cozy shelter and fertile climate. Most of the world’s rose oil comes from this region. Wine and Dionysius were the trademarks of local Thracian civilization, which remarkable artifacts and mysteries still puzzle archeologists today. Flying in Sopot is quite straightforward – a cable chair lift takes you from 550 m amsl high Monastery landing meadow to 1400 m grassy take off; local house thermals are just below and main cross-country directions are along the mountain range, crossing different gorges and passes. The area is good for open distance flights (205 km up to Black Sea), Out and Returns (140 km), FAI triangles (200 km). In case of strong north winds or bad weather in Sopot, there are several good alternative flying sites within 1-2 hours driving. Thus, you can have 80-90% flyable days! - a flying instructor who takes off first to check conditions and then flies around advising and showing thermals, convergence lines, turbulent zones, etc. You only need to fly as much and as far as you want!